Begin at Damascus Gate and walk east along Sultan Suleiman Street and you will soon come to the entrance to Solomon’s Quarries (also called Zedekiah’s Cave). 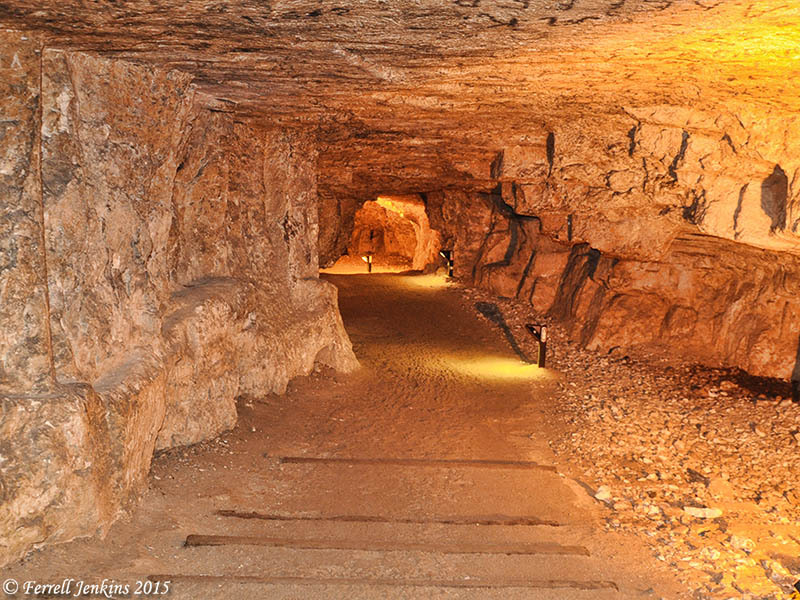 See the previous post for a photo of the entrance and the history of how this underground quarry came to light in the 19th century. Beneath these structures are the so-called Solomon’s Quarries, though we do not think that they should be looked for in the subterranean passages below, but in the area (through which the modern Sultan Suleiman Street passes) between this artificially cut rocky spur of Bethesda and its counterpart (opposite it to the north) which forms a part of Gordon’s Calvary and the traditional site of Jeremiah’s Grotto. (Jerusalem City of Jesus, Eerdmans, 1978, p.16). 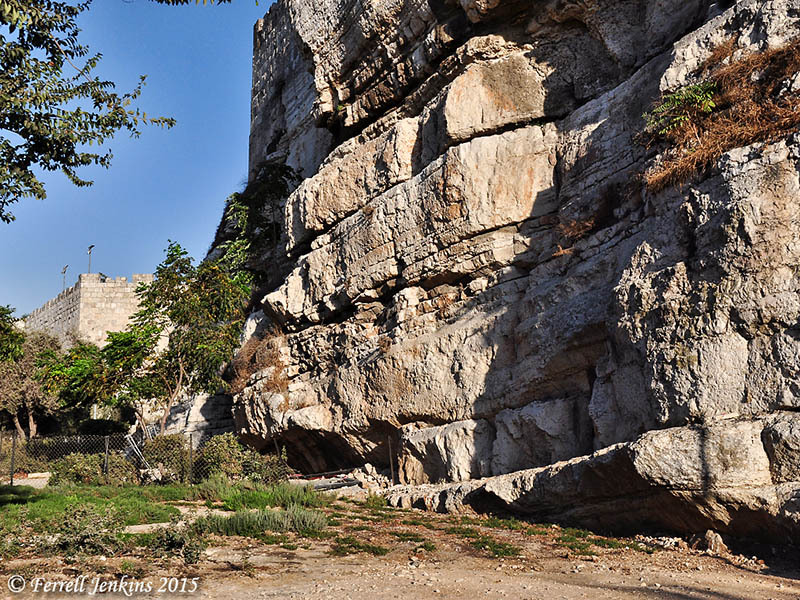 Portions of the north wall of the Old City of Jerusalem is built on a natural scarp of rock. Photo by Ferrell Jenkins. 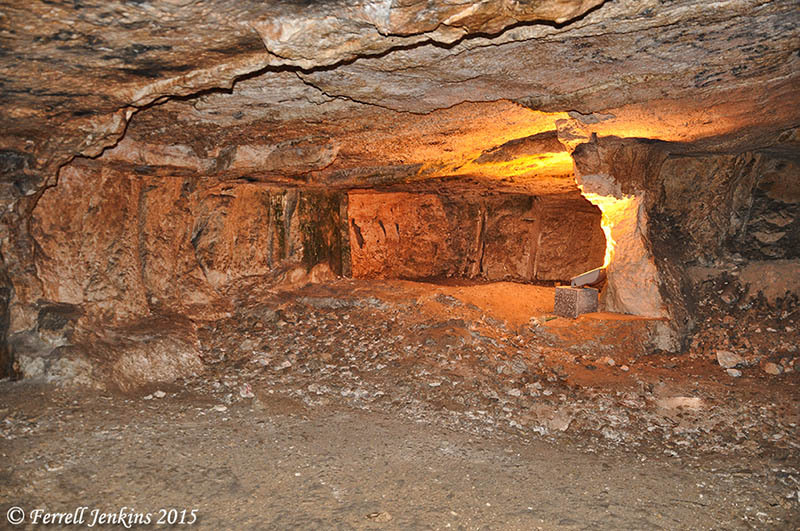 In this post we will follow-up the previous one about the modern discovery of Solomon’s Quarries with some photos. Our first photo shows the corridor leading from the entry south underneath the Old City. Due to the artificial lighting each photo can look different due to the camera settings, and/or due to the adjustments in Photoshop. Corridor leading south from the entry of Solomon’s Quarries. Photo by Ferrell Jenkins. Solomon’s Quarries. Notice the fissure in the ceiling. Photo by Ferrell Jenkins. Next we move into the largest area of the quarries. I think it is in this area where the recent TV series Dig built a pool in which a couple of the characters went skinny dipping. If you have been tempted to watch the series to learn about the archaeology of Israel, you might want to think again. Or, you could read the review in The Times of Israel here. Freemason’s Hall in Solomon’s Quarries. Photo by Ferrell Jenkins. 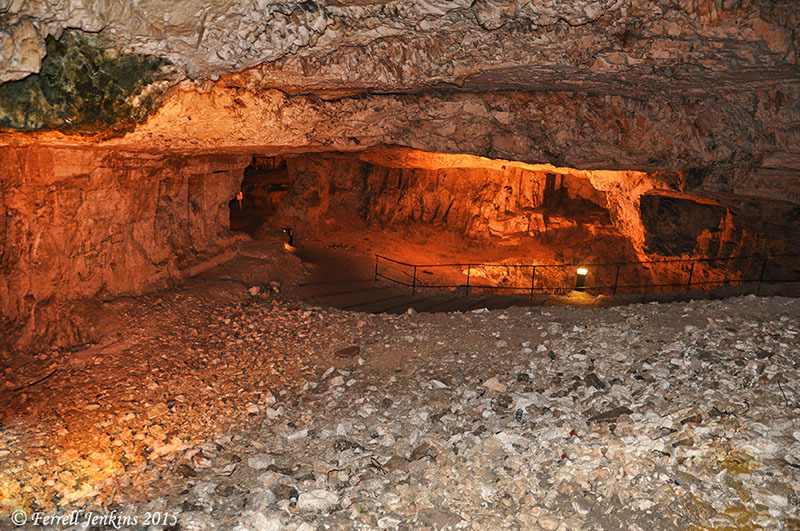 Members of the Freemason’s Society number among the many European tourists and visitors who have come to see the cave after it was rediscovered in the winter of 1854. 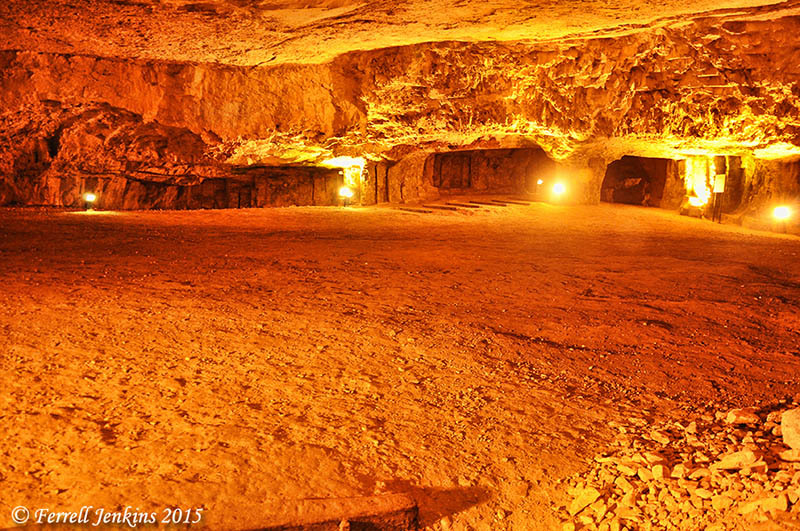 The Freemasons regard King Solomon as the first biblical Freemason, and since the cave was popularly viewed as the quarry used by King Solomon in the building of the First Temple, the Freemasons have held their traditional ceremonies during the past century in the main chamber of the cave. The Freemason’s Hall in Solomon’s Quarries. Photo by Ferrell Jenkins. Earlier we cited Mackowski who suggested that the quarry used by Solomon was probably where Sultan Suleiman Street is now — between the outcropping of rock we showed above and the traditional Gordon’s Calvary. Lasor reminds us that there is no archaeological evidence for this being Solomon’s Quarries, but that the tradition is not unreasonable. A tradition that the stone for the temple was quarried in the area near the modern Damascus Gate, known as Solomon’s Quarries, Royal Quarries, Royal Caves, King Solomon’s Mines, and the cave of Zedekiah, is without archeological support, but the tradition is not unreasonable (cf. 1 K. 6:7). (W. S. Lasor, “Jerusalem.” ISBE (Rev. ed.) Vol. II, p.1008). This entry was posted in Archaeology, Bible Places, Bible Study, Books, Israel, Old Testament, Photography, Travel and tagged Dr. James Turner Barclay, Freemasons, James Turner Barclay, Solomon, Temple. Bookmark the permalink.